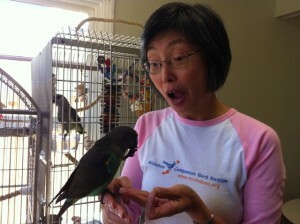 Pamela Lee engages Tango, a Meyer’s Parrot rescued by Mickaboo Companion Bird Rescue. They can be friendly, affectionate, chatty, noisy, curious, clownish, enchanting, playful, shy, and maybe even a little exasperating at times—they are companion birds, and thanks to the dedicated Bay Area volunteers at Mickaboo Companion Bird Rescue, thousands of parakeets, parrots, cockatiels, cockatoos, macaws, and others facing neglect or an early demise are finding new homes. The volunteer-run Mickaboo (a combination of two birds named “Mick” and “Aboo” belonging to the group’s founders) rescues and places a few hundred birds every year, with estimates of helping a total of up to 1,000 birds with its programs. At any given time there are more than 300 birds in the “foster flock”, cared for in volunteers’ homes dotting the region, according to board member Pamela Lee.